Are you rocking your baby for hours to put them to sleep? Is your kid waking up in the middle of the night? Are naps non existent? Do you want to learn how to put your baby on the right path to good sleep from day one? This class is for you! 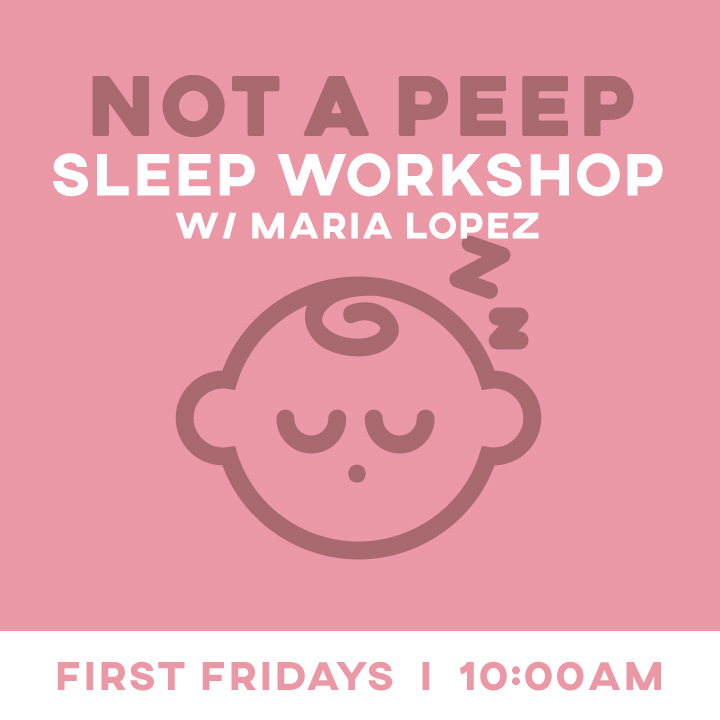 During this 1.5 hours workshop, sleep expert Maria Lopez will teach you about the science of children’s sleep, why problems occur, how to prevent them and how to troubleshoot your current issues. This class addresses sleep issues for children at any age. Bring all your questions! Bring your friends AND your little ones out for First Friday! It's BYOB. Caviar will be providing the food and our resident DJ will be playing the jams. NO FEE FOR ADULTS! Regular drop-in rates apply for children. Who doesn't enjoy a good surprise? Picked at random, each month we will hold a $5 Play day, announced on Instagram the day before. Join Rachael Katz, Child Development Specialist, as she playfully weaves social and emotional learning through interactive storytelling. In this all-ages, family session, Rachael will tell engaging tales focusing on kindness, personal care, turn-taking, healthy friendships, sibling relationships and more. Even better, this storytelling session is free for members and included in the entry fee for non-members! Visit PlayArts this First Friday for a BYO Happy Hour featuring a short performance from our friends at InterAct Theater Company. Located at The Drake in Center City and with support from PNC Arts Alive, InterAct is launching the “PNC at The Drake” initiative, an outreach to meet new audiences and break down financial barriers to attend theater performances. At PlayArts, you can sign up for your own Drake Card, good for four pay-what-you-decide tickets, one at each of The Drake’s Resident Theatre Companies. At PlayArts you'll see a sneak peak excerpt performance of Simpatico's CRY IT OUT, a comedy about parenthood. CRY IT OUT is one of the many plays you can see at The Drake this season. For more information on The Drake or InterAct’s PNC at The Drake program, please check out drakecard.org. FREE for members; Regular drop-in rates apply. Before you brunch… let’s BALLOON DROP! Celebrate Mom with mimosas, balloons, and giveaways Sunday, May 12th from 10 am - 12 pm. Bring Mom, Dad, Grandparents, Aunts and Uncles because this event is free for adults and regular drop-in rates for children. Event begins at 10 am with open play in the playspace, followed by complimentary champagne at 11 am and a balloon drop at noon. Purchase a quarterly or annual membership gift May 6th- May 12th and give a special Mom you know access to a home away from home at PlayArts. Use the code MOMSRULE to receive 10% OFF throughout the week leading up to Mother's Day. PlayArts members receive free entry to play space, a free class series, discounts on events throughout the year and more. We promise the Mom you love will love it!